Almost 90 elephant carcasses have been found during a survey in northern Botswana, revealing “unprecedented” levels of poaching in the country, the conservation group carrying out the study has said. Just nine carcasses were discovered in total during the last audit of the region in 2014, and Elephants Without Borders is expecting this year’s number to rise further because the organization is only halfway through the study, which began on July 5 and is largely funded by Botswana’s Department of Wildlife and National Parks. “While we had elephant poaching in the country before this year, it certainly wasn’t of the magnitude that we’re seeing now. It’s completely unprecedented,” Mike Chase, director and founder of Elephants Without Borders, told CNN. Thato Raphaka, Botswana permanent secretary of land management, water and sanitation services, said that 90 elephants were never killed in one incident, and that a recent survey conducted by Elephants Without Borders found 53 carcasses that had already been reported to the government. Elephants Without Borders said it never claimed the killings were the result of one incident. Botswana is home to the largest population of elephants in Africa — an estimated 130,000 — and has long been seen as a haven for the animals, which have been heavily poached in nearby Angola and Zambia. That is now changing, according to Chase. While cases of ivory poaching were previously reported only along the country’s international borders, this latest survey shows that poaching has moved into the Okavango Delta, a prime tourist destination deep inside northern Botswana, suggesting that Botswana citizens are becoming more involved in poaching activities. Chase told CNN he hasn’t seen this many dead elephants anywhere else on the African continent. Chase attributes the changes to two factors: heavy poaching in Angola and Zambia that has left local populations on the verge of extinction, and the disarming of Botswana’s anti-poaching unit (APU) in May. Before European colonization, scientists believe that Africa may have held as many as 20 million elephants; by 1979 only 1.3 million remained. The first Great Elephant Census, a pan-African survey of the continent’s savanna elephants in 2016, revealed that the situation had gotten far worse. Between 2007 and 2014, numbers plummeted by at least 30%, or 144,000 elephants, the census found. The Great Elephant Census, first conducted in 2016, revealed that the number of elephants across Africa was falling rapidly. In Botswana, elephants were long thought to be safe. 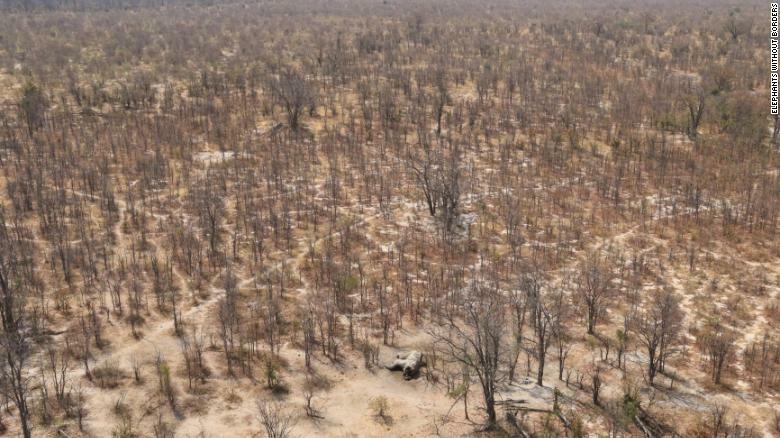 Members of an armed anti-poaching unit patrolled the elephants’ habitats, while Botswana’s military was mobilized throughout the border region, tasked with preventing poaching. In May this year, the anti-poaching unit was disarmed as part of a broader action in which military weapons and equipment were withdrawn from the Department of Wildlife and National Parks (DWNP), according to a government statement. Unarmed patrolmen cannot be expected “to patrol and possibly have contact with armed poachers,” Chase said, adding that he had not seen any members of the APU in the bush during the first two months of the survey. Asked by CNN on Tuesday about the disarming of the APU and the rise in elephant poaching in Botswana, Otisitswe Tiroyamodimo, director of the DWNP, declined to comment. A Department of Wildlife and National Parks representative was present during the current census count. Heavy poaching in Angola is also contributing to the current problems in Botswana, according to EWB. “Those elephants that weren’t killed are moving back to the safety of Botswana, and the poachers have followed them,” Chase said. Botswana has often been referred to a haven for elephants, but Chase said there is now evidence of a high poaching rate. In January this year, China enacted a ban on the sale of ivory products. It followed a near-total embargo by the United States in 2016, and the UK is currently considering introducing “one of the world’s toughest” bans on ivory sales in a bid to protect elephants. The European Union has yet to enact an ivory ban. But demand remains for the luxury product and Chase warned against complacency. The initial results of EWB’s survey suggest poachers are primarily targeting the largest, oldest bulls in the population, known as great tuskers. The ivory is hacked away by a sharp axe and the carcasses covered with bushes in an attempt to conceal the kill, according to Chase. Numbers of great tuskers across Africa have dwindled to about 50, according to various estimates by conservationists. It is also clear that poachers are moving into increasingly remote areas areas to hunt elephants. Six carcasses were discovered Monday during an aerial patrol in one of the region’s least accessible areas, Chase said. Botswana’s wildlife attracts large numbers of visitors, and tourism is the country’s second-largest earner. The surge in poaching potentially threatens not only a major source of Botswana’s income, but also its reputation as a conservation leader on the continent. The rising elephant deaths and the poaching of six rhinos in Botswana this year suggests that the killings may be the work of organized syndicates.